How can a microbe turn these normal insects into fungus-erupting zombies? Read on to find out more. Many different species of Cordyceps are found all throughout the globe1,2 but their life cycle remains enigmatic. What we do know about their life cycle does not bode well for insects, as every species must infect an insect before it can mature and produce spores. While many species of insect are infected by the Cordyceps fungus, the infamous “zombie ants” are the end result of the Ophiocordyceps fungus infecting an ant. By no means limited to ants, the Cordyceps genus of fungus infects a wide variety of different insects with each fungal species targeting a single species or multiple related species3. In fact, evidence shows that each type of Cordyceps fungus has evolved along with its target host species4. After biting down these ants die and a short period of time the fruiting body of the fungus breaks through the exoskeleton of the ant. Check out the video below for some incredible footage of these fruiting bodies in action. Once these fruiting bodies grow from the infected ant the fungus can mature and release more spores to infect new ants. If any ants of this same species then travel through the area where these spores have been released they can become infected themselves. This is the same with other species as well and can lead to insect graveyards where almost all of the insects succumb to this fungus. In order to cope with this kind of infectious assault, some kinds of ants have actually learned to detect infected individuals and remove them from the colony before the fungal spores emerge, thereby protecting the colony from collapse. Thankfully, as humans we will never have to worry about becoming infected with this fungus, as it is so highly specialized to infect insects. This amazing relationship between a fungus and its host species is another example of the surprises found within the microbial world. 1. Shrestha, B. & Sung, J.-M. Notes on Cordyceps species Collected from the Central Region of Nepal. Mycobiology 33, 235–9 (2005). 2. Evans, H. C., Elliot, S. L. & Hughes, D. P. Hidden diversity behind the zombie-ant fungus Ophiocordyceps unilateralis: four new species described from carpenter ants in Minas Gerais, Brazil. PLoS One 6, e17024 (2011). 3. Sung, G.-H. et al. 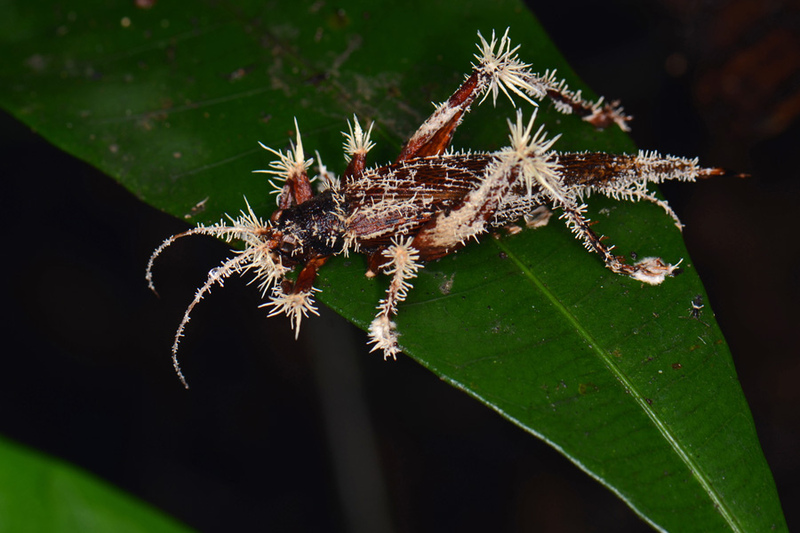 Phylogenetic classification of Cordyceps and the clavicipitaceous fungi. Stud. Mycol. 57, 5–59 (2007). 4. Kobmoo, N., Mongkolsamrit, S., Tasanathai, K., Thanakitpipattana, D. & Luangsa-Ard, J. J. Molecular phylogenies reveal host-specific divergence of Ophiocordyceps unilateralis sensu lato following its host ants. Mol. Ecol. 21, 3022–31 (2012). Hey, very nicely written with cited work. That’s rare from sites I’ve never heard of. Guess why I came here. I came here because of the show Helix. Well together with your permission let me to seize your RSS feed to stay up to date with drawing close post. That looks like a large hunting spider, a tarantula or did eating spider, in the lead picture. I thought this type of fungus only affected insects. That looks like a large hunting spider, a tarantula or bird eating spider, in the lead picture. I thought this type of fungus only affected insects.